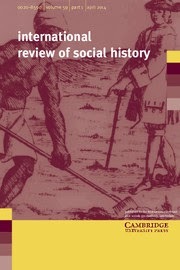 Book review published in International Review of Social History 52(2):303-305, 2007. Please cite as: Deflem, Mathieu. 2007. Review of Policing Paris: The Origins of Modern Immigration Control between the Wars, by Clifford Rosenberg. International Review of Social History 52(2):303-305. This book has an interesting history. Its author, Clifford Rosenberg, originally set out to undertake a historical study of the assimilation of immigrants during the interwar years in Paris on the basis of data gathered in police archives. Going through the relevant police reports, however, Rosenberg soon discovered that not much could be learned from these files about immigrants, but that much could be learned about the police and other elements of the French response to immigrants. Quite similar to the transformation other scholars in the social and behavioral sciences have undergone during their research enterprises, the scene was thus set for a study, not of those who are controlled, but of those who do the controlling. Immigration control is of great significance for our understanding of the identity assigned to immigrants and immigrant groups and which they, in response to heightened controls, adopt as their own. It also offers an important foundation for policies that more resolutely target immigrants as a dangerous class. In that sense, the interwar years of Parisian immigration control must be viewed in close connection with the complicity of the Vichy regime in tracking down resistance fighters and deporting Jews during World War II. Of the more than 75,000 Jews deported from Paris between May 1941 and February 1944, some 90 percent were arrested by the French police. The control of immigrants by the police forces of interwar-time Paris sheds light on the way in which the bureaucratic machinery of policy implementation has contributed to shape the meaning of citizenship and control access to rights and enforce obligations. During the years between the two world wars of the 20th century, France surpassed the United States in terms of the number of immigrants that entered the country. In the light of this influx of people thought to be peculiarly troublesome in view of crime problems and labor issues, the police of Paris began to enforce long-standing policies concerning foreign residence and mobility with increased vigor. To implement such a program, the Paris police created the then world’s largest immigration service, which became the envy of the police from many other nations. The Paris police was an immense force, employing more men than all other municipal police forces in France combined. As Rosenberg shows, the intensity of immigration control in the interwar years both reflected and enabled a radical transformation from a tradition rural society that kept people literally in place to a modern industrial society that was marked by a high degree of mobility. Unlike the exclusionary policies of Vichy, the immigrant controls before 1941 were oriented at the suppression of political violence and the control of the labor market. In the process, immigrant groups also began to define their existence, especially with respect to residence and work, in terms of nationality and citizenship. Rosenberg’s book is theoretically situated against the backdrop of the questions that have engaged recent studies on citizenship and national identity. A defined French national identity emerged rather late, from the middle period of the 18th century onwards, and it was not until the Third Republic (1870-1940) that the boundaries between French nationals and foreigners were more sharply drawn. Until the late 19th century, control of mobile populations mostly focused on vagabonds and the floating population of the poor. To be sure, there were French systems of population control in place well before the 19th century, but they typically applied to all inhabitants. Also, locally varying policies brought about differentiations within the French territory, additionally clouding the distinction between foreigner and citizen. Importantly, the policies to separate foreigner from French national were already in place for some time, but they did not come to life until police controls shifted their focus from social class to nationality. This shift occurred primarily to prevent social unrest by nurturing the indigenous French population at a time when foreign nationals were encouraged to immigrate to satisfy labor needs. Modern immigration controls are therefore not rooted in a mounting xenophobia of the 1930s, Rosenberg argues, but in efforts to maintain public order in the wake of the demobilization politics following the First World War. Rosenberg makes a strong claim against a recent generation of immigration scholars who have sought to dismiss the importance of nationality in favor of a view of the state that would be withering away. In view of this scholarship of the new social history and, more recently, some of the representatives of the transnational and globalization literature, it is now often overlooked to what extent and how national states continue to make use of powerful mechanisms of control and closure. In this book, Rosenberg shows how immigration policies came to be applied in the everyday context of concrete and specific policing activities through which national identity and citizenship were constructed. Immigrant policing activities were part of a bureaucratic quest to achieve complete control in order to preserve societal stability. In this fight against a foreign-based destabilization of society, conservative and progressive political forces were united. Rosenberg unfolds the story of Parisian immigrant control over seven chapters grouped in two parts. In Part I, the author reviews the immigration services that in Paris were responsible for the control of immigrants and how these services were used to control migrant populations, especially in certain neighborhoods with a high number of immigrants. The Paris Police Prefecture overhauled its immigration service soon after World War I in the wake of the success of the Bolshevik Revolution and growing concerns over immigrant criminality. The consequences of the intensified immigration control by the Parisian police ranged from mere warnings over suspended sentences to immediate expulsion. Interestingly, the greatest nationality-based distinction to emerge from the practices of intensified immigration control was not between foreigners and French citizens, but between colonial subjects, especially North African Muslims, and other inhabitants. As recounted in Part II of Policing Paris, the French colonial racism that focused on North African immigrants was reflected in a range of specific programs. The reality of French empire was thereby reflected on a local scale within the territorial boundaries of France, fueled by anti-Arab prejudices. Remarkably, however, the special focus on North African immigrants also involved an investment in special social programs, providing services that were sometimes even denied to French citizens. Among these programs was most strikingly the creation of a hospital that admitted only North African patients. What this shows, is that the police response to control the migrant population could involve both exclusionary policies as well as assistance programs. Assistance and control were of course tightly linked, not only because assistance programs could be awarded or denied on the basis of cooperation with the formal agents of control, but because welfare itself functioned as a form of control and was part and parcel of one overarching complex meant to provide order. A distinction between foreigners and French nationals existed in some form or another for hundreds of years. Yet, such a distinction can remain entirely formal or, conversely, it can become highly concrete and consequential as immigration services are organized and enforced to intervene in everyday social life. What Rosenberg’s study most usefully shows is that the construction of immigration policy lays not primarily in any legal and political texts, but in the enforcement practices by agencies of control. The very existence of groups and individuals as immigrants is thereby constituted in terms of self and others. What is also interesting about Rosenberg’s findings is the unique French expression of the concerns with total bureaucratic control that were otherwise also manifested in many other European nations. Despite the cross-border nature of such bureaucratic models, nationally distinct differences prevail in how and when the machinery of immigration control is implemented. It is therefore important to stress that the immigrant control experience of Paris is historically relevant to the French trajectory of foreigner policing. From the social history recounted in Policing Paris, only very general inferences can be made about similar controls in other national contexts, yet very specific lessons can be learned for our understanding of relevant questions regarding such events as the disgrace of Vichy, the fight for Algerian independence, and the 2005 civil unrests in some of the poor banlieues of Paris.